Our biggest front runner, 6m polycraft. Luxury 4.8m polycraft, with driver’s console. Spacious 4.5m polycraft, stable and open. Interested in hiring a Front Runner? Click here to make a Booking Enquiry NOW! Front Runners are ideal for couples or a family from the 4 seater runabout up to the 8 seater front runner deluxe. All front runners have a canopy, comfortable cushioned seating and the deluxe has a cd/radio player. The electric start 4 stroke motors with trim and tilt will allow you to see up to 20kms of waterways on a day out on the Noosa River. 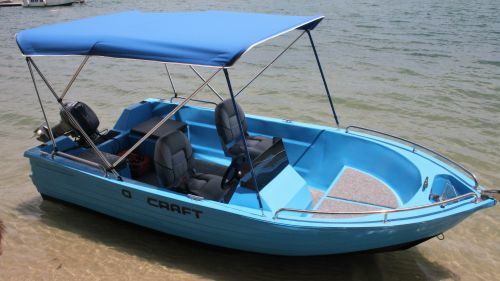 For the best and largest range of boat hire on the Noosa River, book a hire boat with O Boat Hire. If you need something bigger or are on a budget, we have the solution for you with such a large range to choose from. O Boat Hire’s range includes, Deluxe BBQ pontoons, BBQ Pontoons, wheelchair friendly pontoons, cuddy cabs, front runners, kayaks and jet skis.